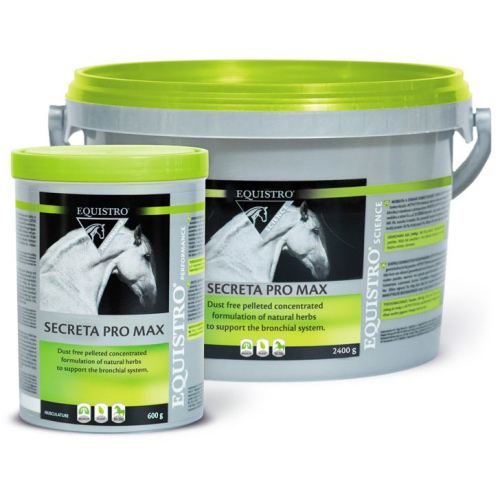 Equistro Secreta Pro Max is a pelleted concentrate for bettered respiratory hygiene, consisting of nine beneficially herbs plus vitamin E. Use Equistro Secreta Pro Max to support the bronchial system and natural respiratory defences on a long term basis. Add to the feed ration. During the first 7 days, the following quantities should be doubled. Average sized horses (500kg): 1-2 scoops (20g)/day. Light horses: ½ scoop (10g)/day. Ponies: ½ - 1 scoop (10g)/day. Foals: ½ the above administration.